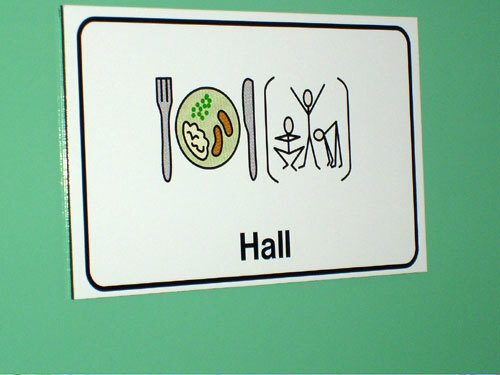 Symbols can contribute to economic well being of the individual and the learning environment. Economic benefits within the School Environment enable schools to meet targets by supporting the curriculum with symbolised resources. Transition from one school to another can cause anxiety for pupils who find it difficult to handle change. These booklets were made for pupils transferring from Infant to Junior school, and Junior to Secondary School. 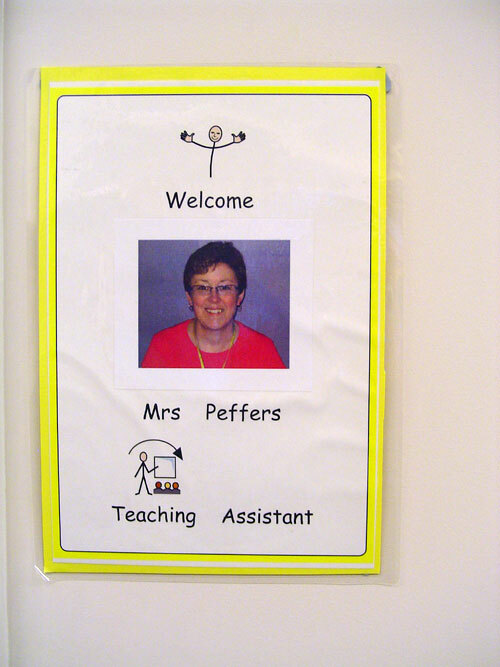 They are personalised for each pupil with photos of people and places they will encounter in the new setting. Ideally the pupil will have been to visit the new school and talked about what they would like photos of. It is useful to discuss what things are causing particular worry, so they can be included in the booklet. The pupils take the booklets home with them, so they can be looked at for reassurance over the Summer Holiday. 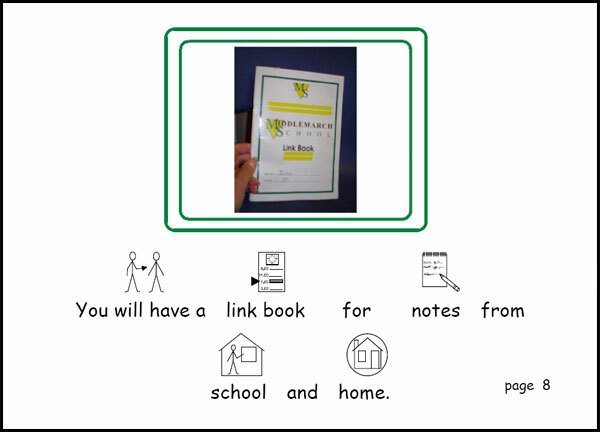 The Secondary school transfer booklet was made for the pupil to take with him on Induction Day at the end of the summer term. It gave him visual prompts about the site and the places he needed to be. 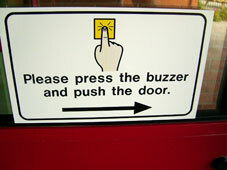 Some pupils use them for the first few weeks of the new term. 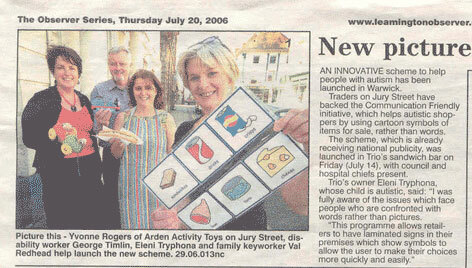 Work in the community to facilitate independence within society. "An innovative scheme to help people with autism has been launched in Warwick. Traders in Jury Street have backed the Communication Friendly initiative, which helps autistic shoppers by using symbols of items for sale, rather than words. The scheme, which is already receiving national publicity, was launched in Trio's sandwich bar on Friday, with council and hospital chiefs present. Trio's owner, who's child is autistic said " I was fully aware of the issues which face people who are confronted by words rather than pictures. 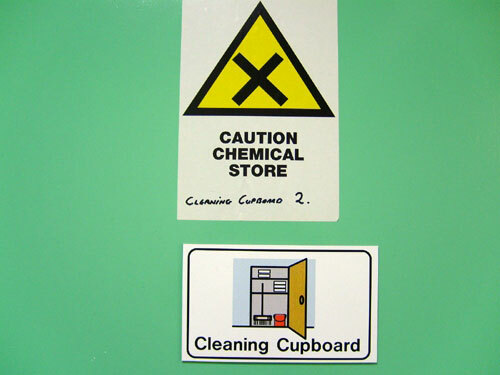 This programme allows retailers to have laminated signs in their premises which show symbols to allow the user to make their choices more quickly and easily"". 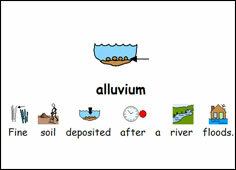 Geography resources have been made to support Key Stage 2 and 3 learners with information about Rivers and Coasts. The packs give access to symbols for all the key vocabulary along with photographs of many of the features of Rivers and Coasts. 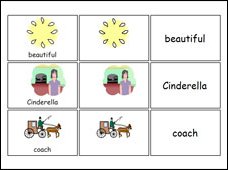 The visual materials support students who have difficulty acquiring and retaining new vocabulary. 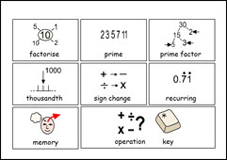 The symbols also help learners to understand the concepts that are being taught and assist them in explaining their understanding. 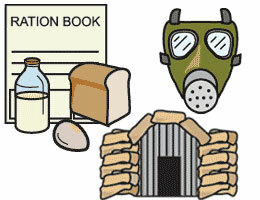 History packs are available on Romans, World War II, Egyptians, Greeks and Victorians. 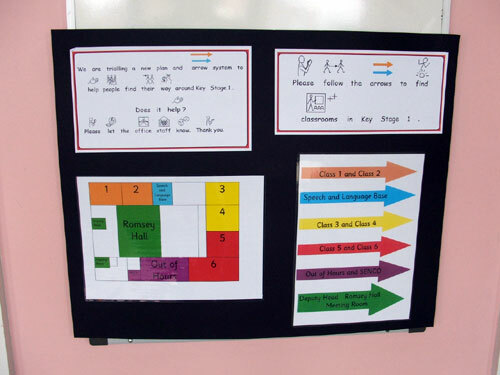 A resource pack of activities is also available for each topic, giving teachers ready made materials to use to reinforce learning. 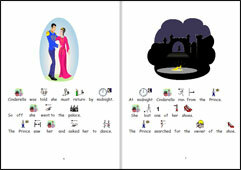 Five different levels of differentiated books are included in each pack. For example, in the World War II pack there is information on : World War II (general overview), The Blitz, Life for Children, Life at Home and The War in the East. 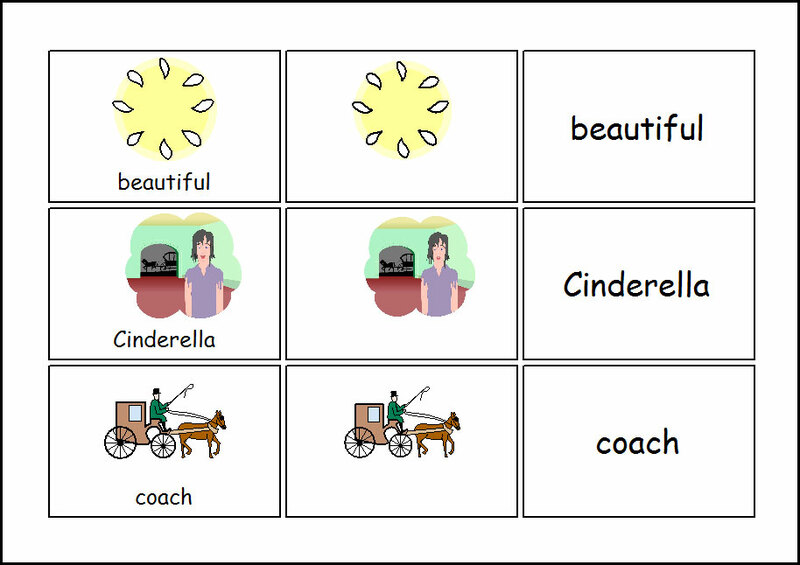 There are many resources to support Literacy, such a Cinderella; one of five Traditional Stories. 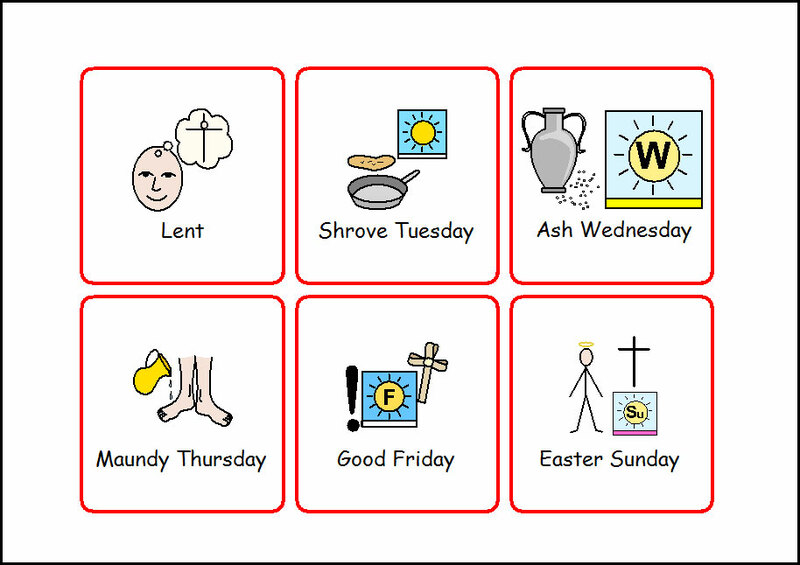 Materials to support Religious Festivals include Easter, Diwali, Hannukah and Christmas. 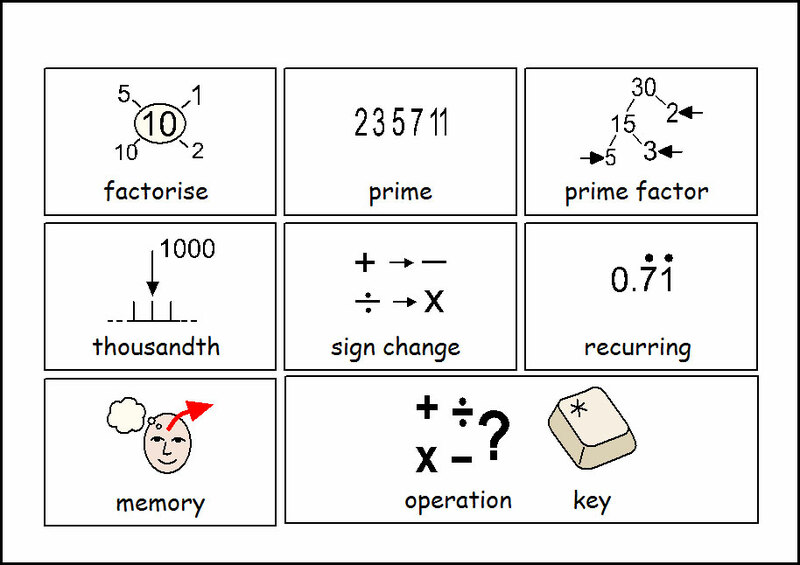 These can be used with students across the Key Stages depending on their skill levels. The materials are also useful to support Assemblies and the graphics can be used in displays. 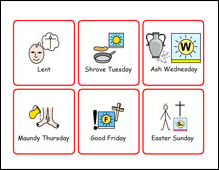 Yearly Calendar Resources packs give students visual support for concepts of time which are abstract and hard for some pupils to understand without a visual reference. 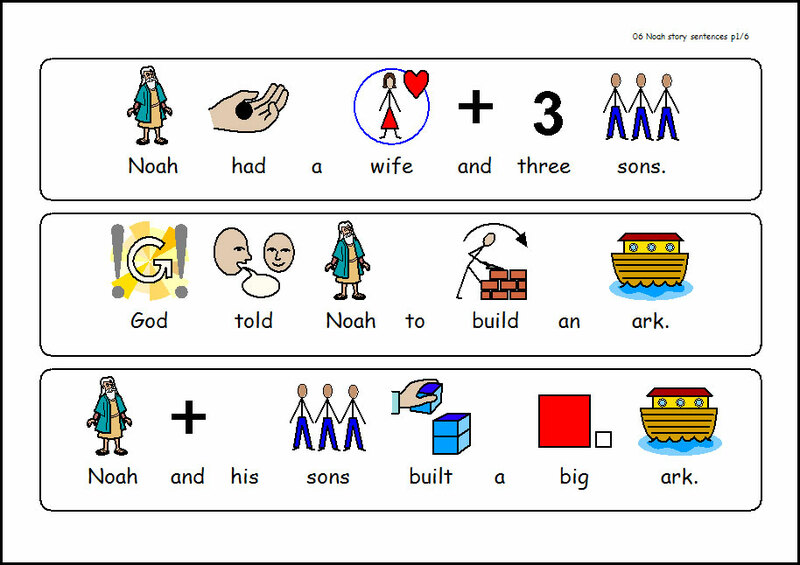 Symbolised sentence strips for stories such as Noah support sequencing activities. 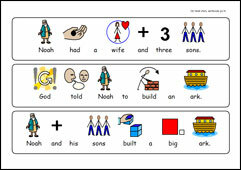 They can either be cut up and stuck in the right order, or can be copied by pupils into books. Symbolised Play scripts for five traditional stories, Cinderella, The Three Pigs, Goldilocks, Snow White and The Three Billys Goats Gruff and the story of Diwali support speaking and listening targets in Key Stage 1 and 2. 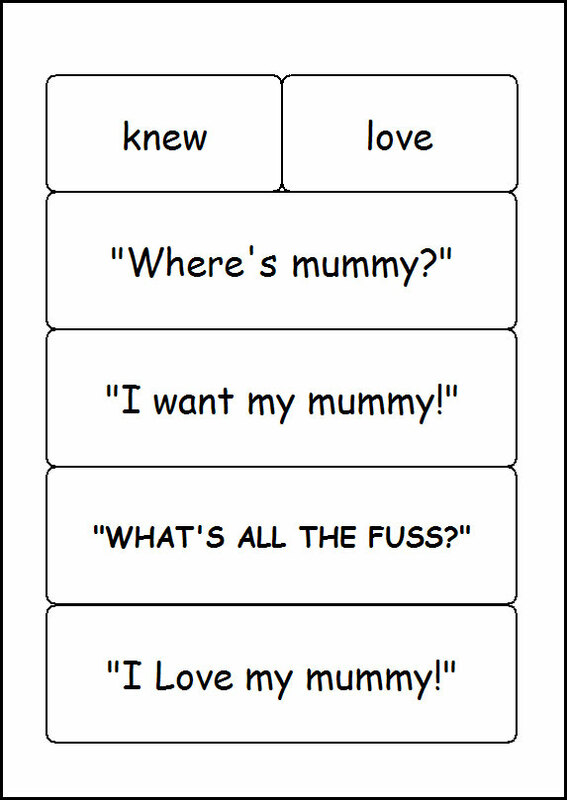 Staff can download a series of early reading books that use the first 45 high frequency words. 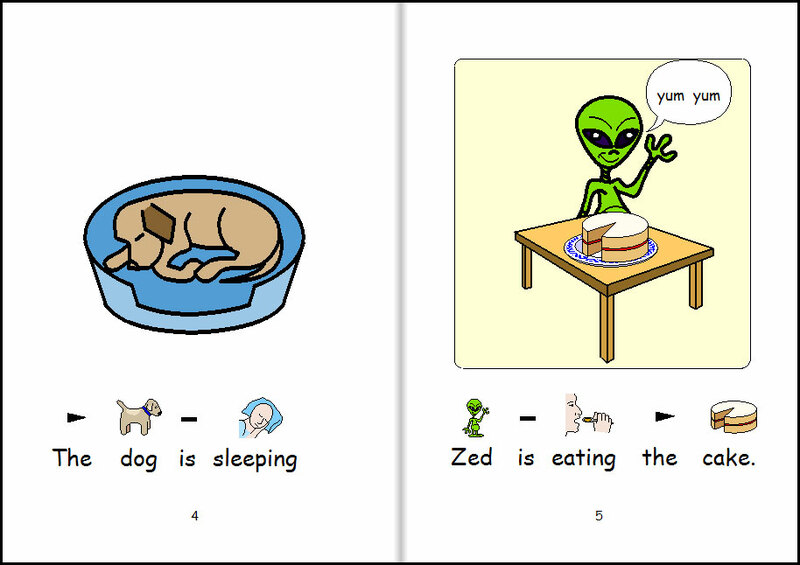 They are written round a friendly alien character called Zed who has adventures on earth. Fifteen Big Books have packs with symbol flash cards for the key vocabulary, along with words and phrases that can be used to reinforce learning. The examples show Handa's Surprise and Owl Babies. 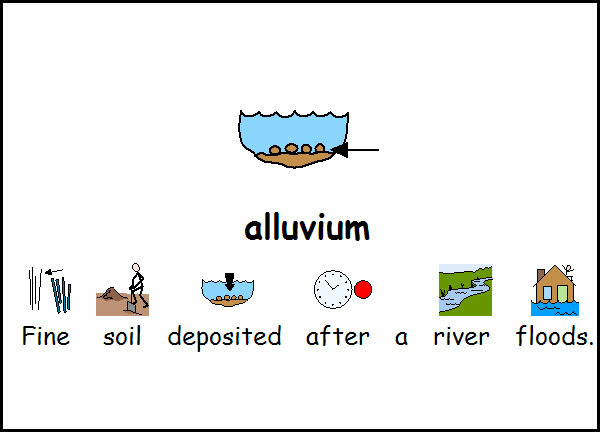 There are many activity sheets to support science topics from Foundation Stage to Year 5. 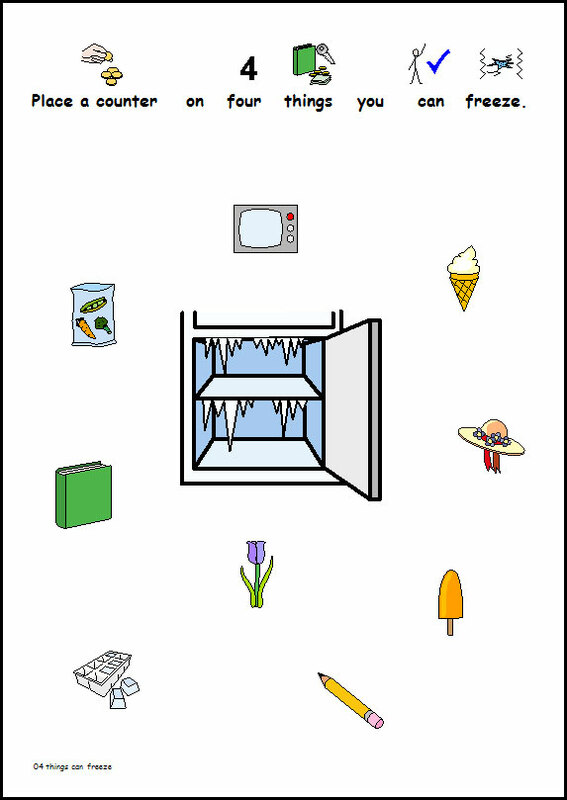 The examples below show a sheet where pupils indicate what things would freeze by drawing a circle round them, and an activity to discriminate between objects that are magnetic or non magnetic. 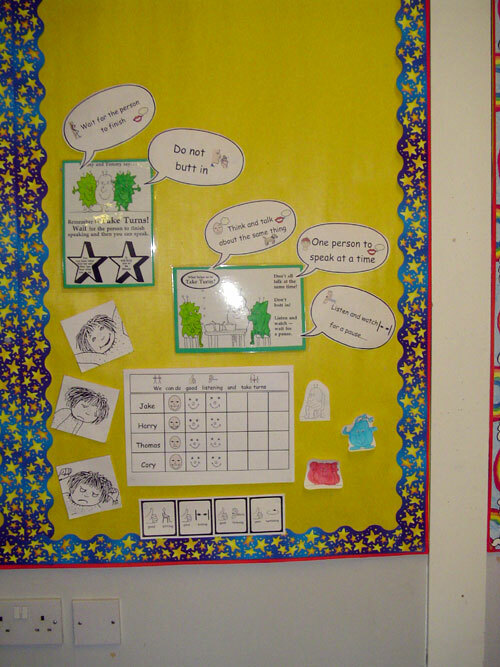 Pupils could cut these out and then stick on a separate sheet in the two groups. 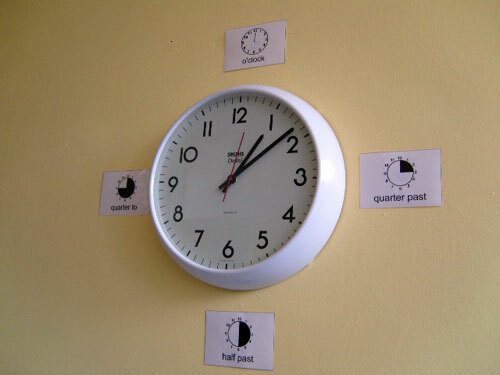 It is important that all pupils have some understanding of money and time concepts. 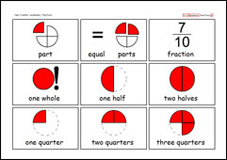 Symbolised numeracy vocabulary can support pupils in their learning within these and other areas of the numeracy curriculum. 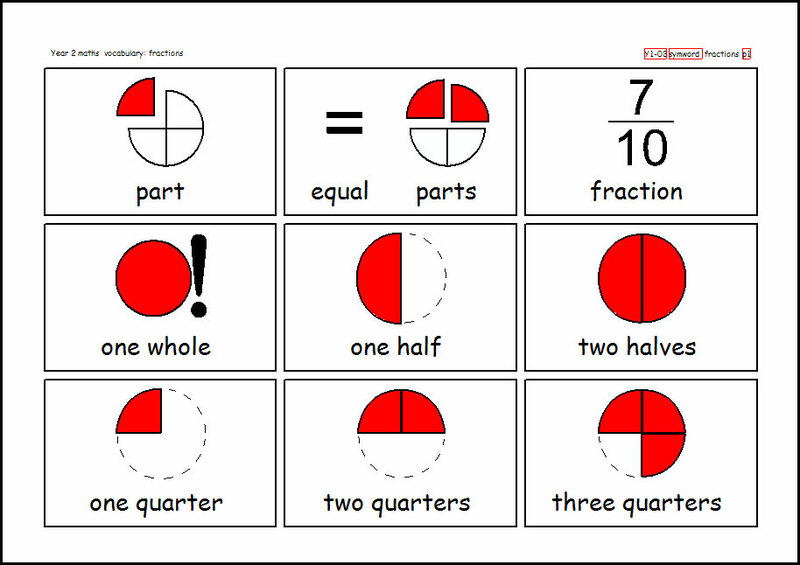 All the vocabulary as detailed in the Numeracy Framework has been symbolised. 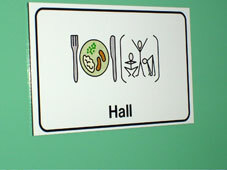 Schools have been encouraged to make their premises more 'communication friendly'. 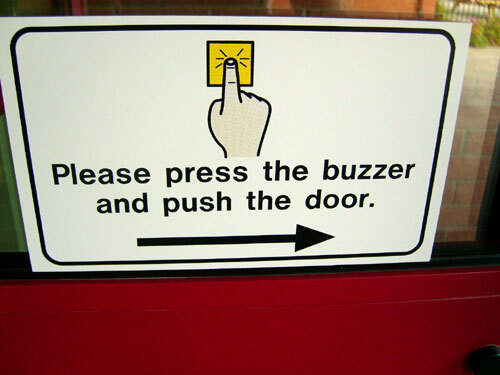 This could involve making a colour coded map to help visitors and pupils navigate round the building as well as symbolised signs on doors. 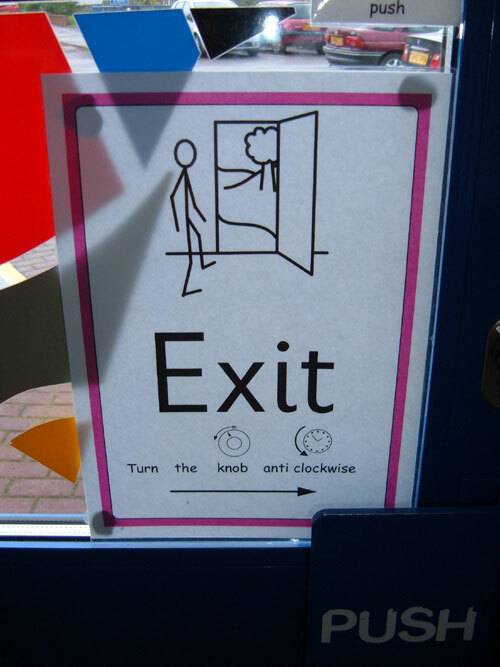 Instructions on how to get into and exit the building are also helpful. 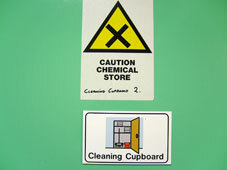 Pictures of the staff working in a classroom with information about their role is useful for pupils and adults on site. 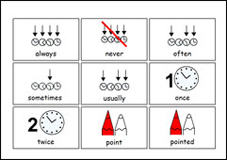 The above examples show symbolised Numeracy vocabulary in a Y6 class, Literacy support in Y3 and support for telling the time in Key Stage 1. 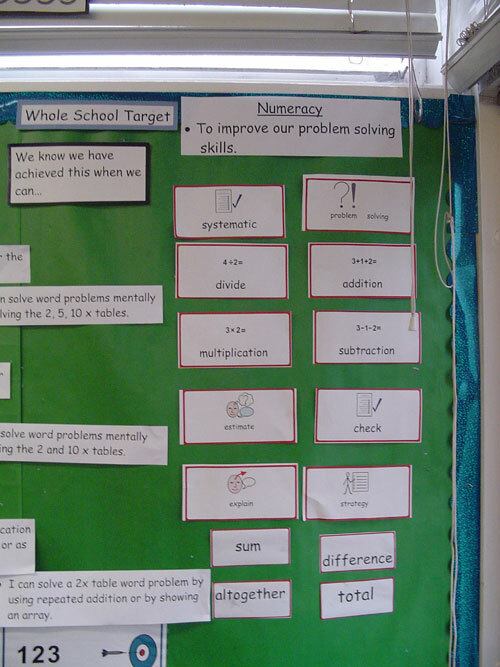 - The Numeracy display has symbolised key words for problem solving skills. This gives a visual reminder for all students about what they need to think about. They act as prompt to help independent working. 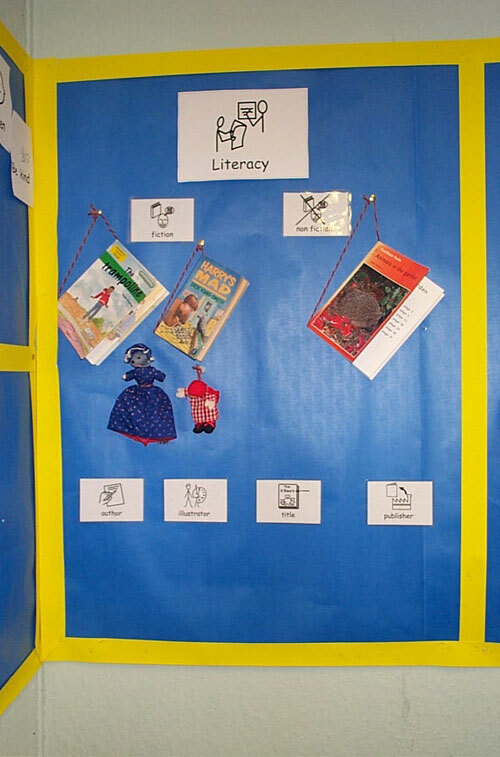 - The Literacy display has real objects as well as symbols and shows the difference between fiction and non-fiction books, along with explanations of author, illustrator, title and publisher. Pupils are immediately cued into the lesson and are reminded about the learning from previous lessons. 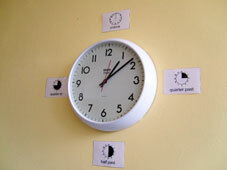 - The clock has had symbols for o'clock, half past, quarter past and quarter to added to help pupils tell the time independently. 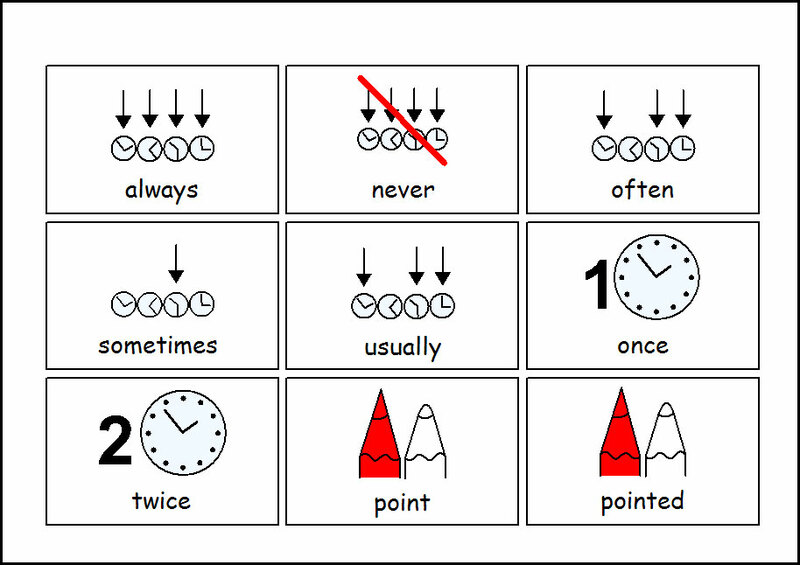 All these examples show how symbols can support independent learning. 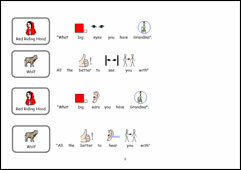 Some students have difficulties in the area of communicating and interacting with their peers and with adults. Such problems can make independent learning more difficult. 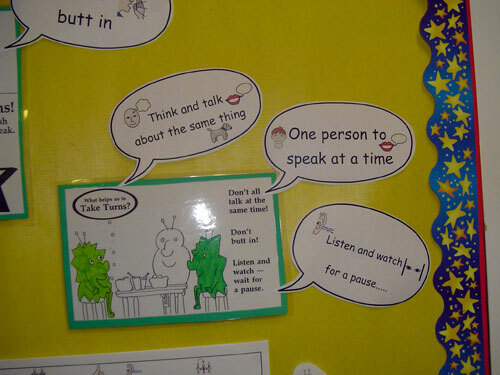 Social Groups can help some pupils learn communication skills which supports independent interaction. 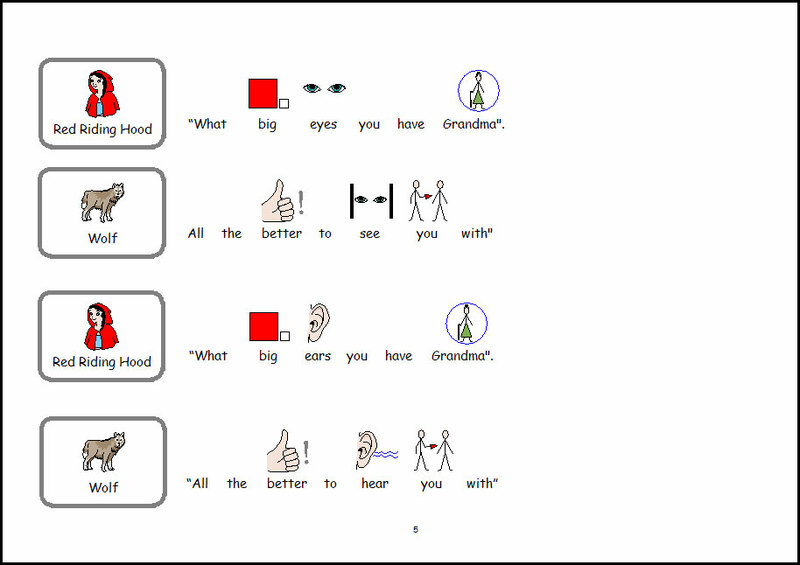 Symbols can be used to reinforce vocabulary and concepts as these examples illustrate.